The birthplace of hard chocolate, Fiat and vermouth, Italy’s elegant first capital was also the inventor of everyone’s favourite chocolate spread and even the country’s film industry. Join us on a short break to this delicious city for a taste of its fascinating history and mouth-watering food! It is the birthplace of the aperitif and nutella! 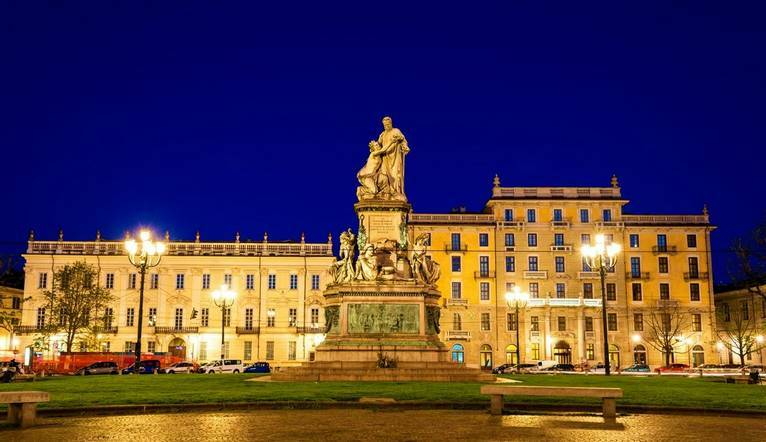 Framed by the Alps, and filled with enough mouth-watering food and drink to warrant a few days of guilt-free indulgence, Turin is bursting at the seams with outstanding beauty and unmistakably Italian experiences. This scenic location of the 1960s film, The Italian Job, is also the capital of the Piedmont region and home of the ‘Slow Food’ movement. Our guided walk of the city amongst the squares, monuments, churches and palaces showcases how the culture and society of Piedmont have been influenced by chocolate over centuries. Some stopping points include the Palazzo Reale, built in the 16th century; Palazzo Madama, the municipal museum of ancient art; and the Palazzo Carignano. We will also stop for a gourmet break at one of the many historic cafés; these cafés are where the Piedmontese art of pastry was born, earning the city the title of Italian Capital of Chocolate. From this tradition comes the creation Bicerin, a drink made from espresso, bitter chocolate and whipped cream that's been enjoyed by Alexandre Dumas and Ernest Hemingway. We can also sample Gianduitto, the typical local chocolate containing the hazelnut produced in the region. According to sources, the ‘in’ drink in 2017 was the aromatised and fortified wine, Vermouth. ‘Born’ in Turin in the 1700s, this legendary ingredient is found in many cocktails including Martini and her sweeter sister Manhattan. We have the opportunity to make our own as we are guided by Fulvio Piccinino through a fascinating laboratory, tracing the history and hearing stories and curious anecdotes before a tasting. After, we will then be given instructions on how to prepare our own bottle using wine, herbs, sugar and extracts. There will be plenty of time to discover the city on our own but remember to visit the historical Café Al Bicerin in Piazza della Consolata or take the panoramic lift to the top of the Mole Antonelliana for 360 degree view of the city and the surrounding alps. Perhaps while away the afternoon and satisfy the senses with a rich velvety hot chocolate people watching as the winter draws in and the smell fills the air! Great holiday, lots to do and see. The Tour Leader was excellent. Very good itinerary and restaurants and the hotel was lovely. I thought the holiday was amazing, very well thought out and a great mix of history, culture, sightseeing, food and entertainment. Great place to spend a long weekend. Our friendly hotel is located in the quiet residential area of Crimea next to the River Po and just a 20 minute walk or short bus ride into the centre of the city. There is a breakfast room and small cocktail lounge and plenty of local restaurants nearby. Bicycles are also available to rent. Our rooms all come with air-conditioning, minibar, safe, cable TV, fridge, complimentary WiFi and hairdryer. The transfer from Turin Airport to the hotel is approximately 30 minutes, depending on traffic. Please note that a Tourist tax of €2.80 per night is payable locally at the end of your stay.